Chiangmai night Safari has provided a photo corner together with a professional photographer helping you enjoy taking the memorable photos with our animals' offspring such as lion, tiger, crocodile, bear, snake, and orang-utan. 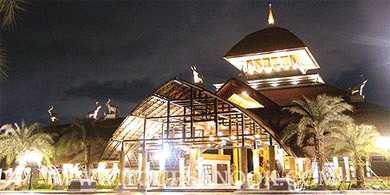 Chiangmai night Safari features the Lanna Village buildings in a fusion of African and Lanna styles. The entrance hosts the Chiangmai night Safari souvenir shop, the local village handicraft shop, the multi-purpose terrace, the photo corner and the food court. For a great release for children we have fun avoiding the wet zones that spring up everywhere in the area of the Fun Plaza. As well, you can enjoy the spectacular lights and fountains moving to the rhythm of the music. Visiting the Jaguar Trail exhibition zone, tourists can have a relaxing walk through the 1.2-kms distance taking time about 1/2 ~ 1 hour and it is available both day and night time. For the Savanna Safari and Predator Prowl, the tourists have to get the reserved tram provided at the separated station into the zone only on night time. A ticket is possible for all the allowed zones.